Media Pitches Market Increase As Confidence In Obama; What About Market Drops? WASHINGTON — New York Federal Reserve Bank President Timothy Geithner is expected to be President-elect Barack Obama’s choice to head the Treasury Department. Reports of his selection sent stocks soaring at the close of trading Friday. There’s that obvious question that needs to be asked: if you say the market “soared” because of Obama’s appointments, shouldn’t you have to figure they tanked because people started second guessing those selfsame appointments when it drops nearly 700 points only a few days after “soaring”? Not when you’re crazy in love with Barack Obama, you don’t. Historically, the market almost ALWAYS goes up in the days immediately prior to Black Friday. There were clearly reasons OTHER than, “Boy, those Obama picks sure are awesome!” to account for the market increase last week. I found this funny: the market goes up, and Obama is over-the-top wonderful ruling and reigning from his just-invented “Office of the President-elect.” The market totally tanks only FOUR business days after the “soaring” stories and the AP headline – “Dow plunges 679 to fall to lowest level in 5 years” conveniently omits any link to Obama. 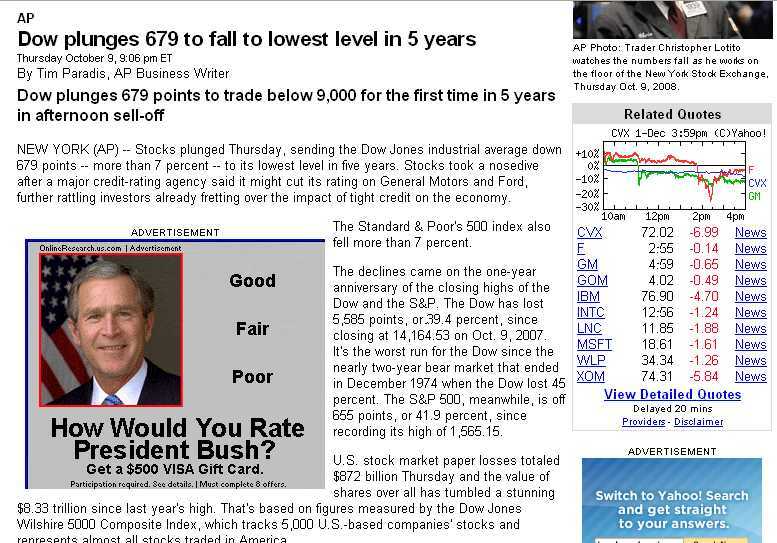 So you have the essence of the media strategy: market goes up: “Way to go, Obama!” Market goes down: “That damn Bush!” Expect to see every iteration of that under the sky for the next few years. The neverending media narrative: Economy goes up; credit Democrats. Economy goes down; blame Republicans.